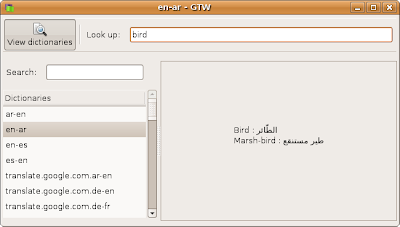 The GNU Site has a great project download called twandgtw, which translates, loosely, into "Translate Word and Graphical Translate Word" (Basically, you can run it from the CLI, but it does have a X-Windows component, as well. Actually, there are three separate packages you can download: tw, gtw or ktw (first revision of a front-end for KDE). You can download straight-up RPM's for Fedora Core 6 through 7 from the main download page, which also includes tar.bz2 zipped-up source-code tarballs. If you don't have bzip2, you can pick it up here. bzip2, like tar, is pretty standard nowadays, and probably comes with whatever version of Linux you're running.